Refrigeration Safety Archives - Barrow Systems, Inc.
Refrigeration is important in our daily lives. Keeping product at specific temperatures is required for industrial processes as well as preservation of various food items. Ammonia refrigeration by design is a mechanical pressurized system containing a Hazardous Material. By law these systems are required to meet minimum safety regulations that include a detailed reporting protocol for any unexpected release of ammonia. If an overpressure condition occurs, Relief Valves are designed into the system by code to relieve the overpressure condition, either to atmosphere or secondary containment. In any case, a release event must be reported to the National Response Center in a timely manner with details of the event. When reporting a release event, the required information must include the start, the end and the duration of the event as well as the estimated quantity of ammonia released. Compliance with reporting of a release event has been a subjective process at best because in large ammonia systems with many vessels and multiple processes it is virtually impossible to determine where the release originates or when it occurred. Without a defined start time the reporting is inaccurate. Without a known origin of a release, it is unlikely that the end of the event can be defined. Without the timing of the event, duration is unknown and so is the loss of ammonia in pounds. Many times there is a delay in reporting a refrigerant release because of confusion about what vessel was experiencing high pressure and subsequent release, how many pounds of refrigerant were lost, etc. Resulting fines from Federal, State and Local governments for late reporting have been very costly to these facilities. More than 6,000 pounds of anhydrous ammonia spewed from a refrigeration building at the plant for about seven hours. Environmental regulations require plants to immediately notify the National Response Center, the state Department of Environmental Protection and local emergency planning offices if a plant leaks more than 100 pounds of anhydrous ammonia. The U.S. Environmental Protection Agency is seeking a penalty of $46,408 against (company name withheld) for not immediately reporting a chemical leak to the proper authorities, officials said. The U.S. Environmental Protection Agency today announced a settlement with food processing company (company name and location with held). The company has agreed to pay $157,900 for violations of federal regulations including failing to notify the proper officials immediately following the release of anhydrous ammonia, failure to submit a required Risk Management Plan, and inadequate chemical accident prevention. BSI was called in to a client’s facility where several ammonia releases had been reported. BSI was asked to evaluate what had happened and to make recommendations to prevent additional releases. Upon review, it was discovered that some of the releases were due to Leak Detector monitoring devices (sniffers) providing “false positive” alarms. There were also other releases directly attributable to vessel over pressure conditions. There are a good number of refrigerant pressure vessels with a combination of single and dual relief valves in this facility. All relief valves were piped into a common vent header (in compliance with national codes) which was piped outside to a containment vessel. There was an ammonia sensor (sniffer) in the vent header which detected the presence of ammonia in the header near the containment vessel. Determination of a specific pressure vessel or relief valve experiencing an ammonia release proved impossible. There were no operational alerts indicating a relief valve release condition, only a vent header full of ammonia vapor as a result of a relief valve release. There was no way to determine if an actual refrigerant release had occurred other than a “sniff” test. There was no way to determine if an over pressure condition had existed or where it may have occurred. There was no realistic method for determining and reporting the time span for a refrigerant release. There was no method for accurately determining and reporting the loss of refrigerant. Prevention of an ammonia release is the primary goal with this system, however if a release of refrigerant (anhydrous ammonia) does occur, this system is designed to provide the facility with pertinent information necessary to comply with the E.P.A.’s reporting requirements. This technology is designed to give facilities the tools to make reporting a refrigerant release quick, accurate and easier than ever before. This system solves so many reporting issues when a refrigerant high pressure event takes place. Safe practices when working around relief valves. Wearing safety glasses, full face shield or both when working with relief valves. Having breathing apparatus available in case of emergency when working with relief valves. Use valve handle “lock out-tag out” procedures, to safely service relief valves in system. Knowing the location of and having access to safety showers, bubbler fountains, water hoses, exits, and first-aid equipment when working with relief valves on ammonia systems. Relief valves must be replaced every 5 years whether they have blown or not. Relief setpoint typically shifts to a lower setting, therefore valve could release or simmer at a lower pressure. Inadequate protection of pressure vessel due to setpoint change. Typically the setpoint shifts low but not always. Reliability. In time of emergency, you need to be sure your relief valve will operate properly. C = minimum required discharge capacity of the relief device in pounds of air per minute. D = outside diameter of vessel in feet. L = Length of vessel in feet. A number of guidelines for pressure relief Valve service and maintenance exist to ensure that pressure relief valves work correctly. Some tips in brief include the following. Atmospheric discharge lines should have adequate rain and moisture protection, and be capable of draining condensate and rainwater. Check to make sure the relief valve exit stays unobstructed. Routine maintenance of pressure relief valves should include visual inspection of the relief valve and discharge piping every six months. Relief valves should be replaced at intervals of no longer than five years of service. Maintain pressure relief valve data in an inven­tory record, including location, size, set pres­sure, manufacturer, capacity, date installed, dates of inspections, and latest date for replacement. Pressure relief valves should not be discharged during installation or start-up. Replace pressure relief valves once they have discharged. Never expose your face or body to a connected relief valve exit. Avoid trapped ice build up between valves and other equipment. Reduce inlet pressure to zero before attempting to install or replace any pressure relief valve. Preferably, and as required by most codes, use a three-way dual shut-oft valve to isolate relief valves for individual inspection or replacement. Check the nameplate or installation date tag to be sure the time-in-service does not exceed five years. Look for corrosion and leaks. If there is any doubt about the internal condition of a relief valve, remove and inspect it internally. If there is any question about a valve’s condition, replace it. While ammonia is not a poisonous gas, it does severely irritate the mucous membrane of the eyes, nose, throat and lungs. A very small concentration of ammonia is easily detected in the air by its sharp, pungent odor. This serves as a warning. Prolonged exposure to air containing 100 parts per million (ppm) of ammonia is not harmful but concentrations exceeding 700 ppm will cause irritation of the eyes and may cause permanent injury. Concentrations of 5,000 ppm or more may be fatal causing spasm or inflammation of the larynx. Liquid ammonia should never come in contact with skin because it freezes tissue, subjecting it to caustic action. Symptoms of such a burn are similar to a thermal burn. A. Being familiar with the system design, the components, pressures in different areas of the system and location of isolation valves in a system. B. Safe practices when working with ammonia. Having and wearing breathing apparatus around higher concentration of ammonia. Proper procedures when handling ammonia, purging oil from an ammonia system and charging ammonia. Use normal electrical “lock out-tag out” procedures. 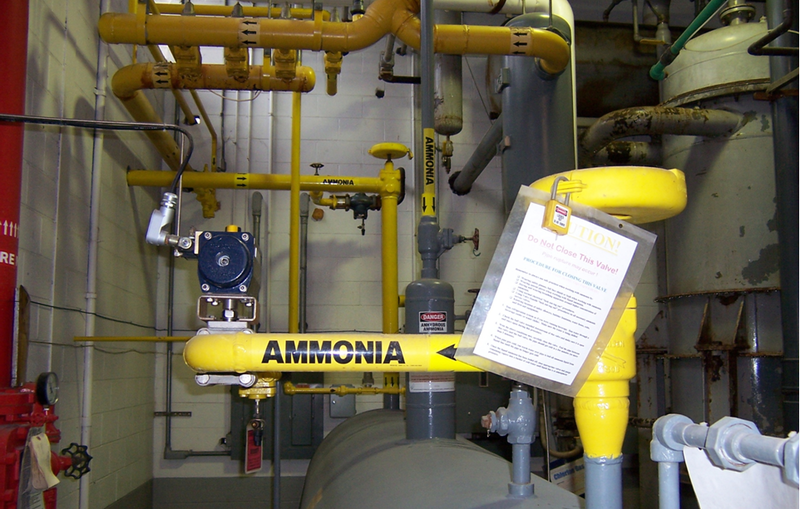 Use “lock out-tag out” procedures on all necessary ammonia service valves to safely service components in system. C. Methods for properly handling ammonia containers and equipment. D. Location of safety showers, bubbler drinking fountains, water hoses, exits, and first-aid equipment. E. The urgency of immediately reporting any unusual odor of ammonia. Removing any ammonia-saturated clothing instantly. Getting patient to lie down and provide him with fresh air. Provide oxygen if patient’s breathing is weak or administer artificial respiration if breathing has ceased.